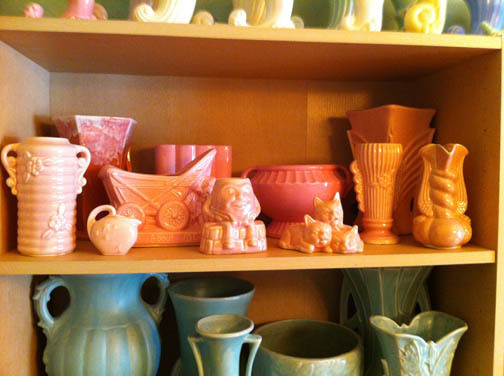 American pottery is one of the most beloved, enduring—and lucrative—flea-market collectibles. Find out why McCoy pottery is so hot with this inside look with avid collector Terry Kinsey–and how to display it and other vintage finds with tips from another collector, Kelly Clark. Terry Kinsey offers advice for starting your own collection. History: In addition to making molds representing different decades, McCoy was approached by major companies to produce promotional products. Quaker Oats commissioned a glass version of their popular round cereal box; Pontiac commissioned products such as jars. At the time, consumers could buy these items at the dime store for a few dollars; today they are worth $800 to $1,500. The company finally had to shutter in 1991 due to offshore competition. Maker’s Marks: McCoy’s maker’s marks were inscribed at the bottom of the pieces, and they changed through the decades. Next to the company’s name is a mold number. After World War II, the company put “USA” next to the name. 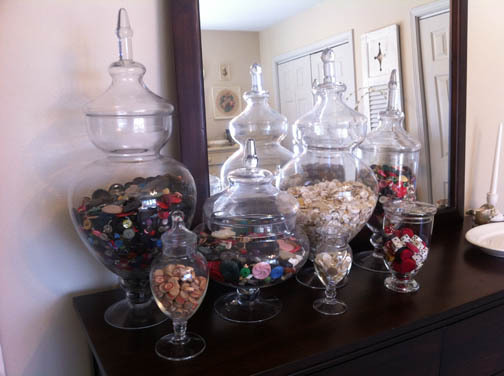 Pricing: Prices range from $10 (around 39 cents originally) for small items to thousands of dollars for large items like cookie jars. 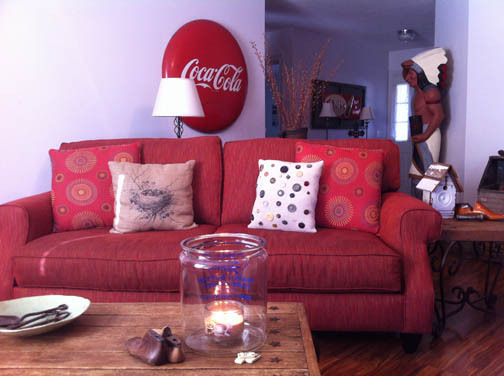 Kelly has filled her living room with flea-market finds, both kitsch and rustic: a throw pillow flecked with buttons, antique keys laid out on a ceramic tray, a candle in an oversized mason jar, a patinated birdhouse and equally worn coffee table, two gigantic 1950s Coca-Cola advertisements and an antique shoehorn (Photo: Kelly Clark). 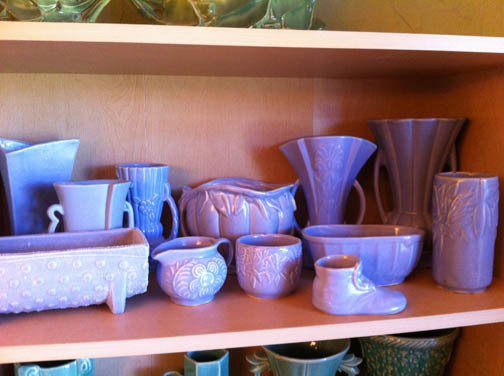 Market Appeal: Many celebrities are McCoy pottery collectors. Andy Warhol collected McCoy cookie jars from the 1950s to the ’70s. He likely paid only a few dollars for them; after he died, his collection went up for auction with each piece selling for thousands of dollars. Arranged around the antique, cast-iron wood stove, Kelly’s vintage finds render the stove the living room’s centerpiece. 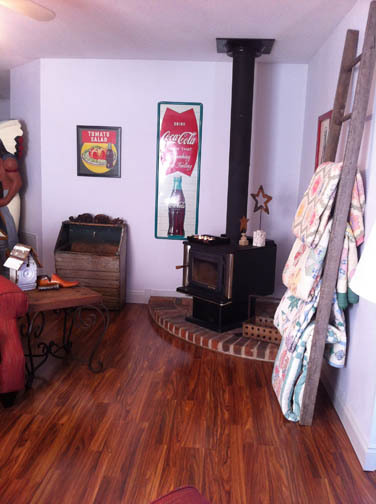 Three more decades-old Coke advertisements add color, while a primitive sideboard she’s refrained from refinishing complements the stove’s rustic feel. For an easy display, Kelly has draped a patinated ladder with thrifted quilts (Photo: Kelly Clark). Where to Find Them: Terry advises going to reputable antiques malls to purchase them, as inferior reproductions abound. His website, mccoypottery.com, also verifies authenticity. How to Display Them: Quilt designer Glenna Hailey, of hollyhockquilts.com, was attracted to how well the colors went with her cottage décor. She amassed a collection of 25 pieces, most with a garden theme. “I display them in a built-in bookcase alongside vintage prints, birdhouses and books to help elevate other pieces,” she says. This entry was posted in Hot Collectibles and tagged American pottery, flea market collectibles, McCoy pottery, McCoy pottery collectors by Flea Market Decor. Bookmark the permalink. Interesting article. I have a shop in Havana, Florida and McCoy isn’t moving at all there. Some of the dealers have just plain packed their up to go in storage until the tide turns. Hopefully this trend is making it’s way down here.